Many working professionals share your same goal of progressing into management. One area of management that could complement many skills is administration. The U.S. Bureau of Labor Statistics projects job openings in the field of administrative service managers to grow faster than the market average through 2026 due to both the creation of new positions and current administrators retiring. If you want to be in the best position to fill one of these openings, you need to have every resource at your disposal. Once such resource is a well-composed resume. There are plenty of templates out there that may show you how to write a resume, but most of them offer only general guidance. The administrative resume templates shown here, however, fit either a particular company or incorporate the latest best practices in resume writing. Why Use Administrative Resume Templates? Administrative skills are valued because they often apply to multiple industries. Thus, you may be applying for an administrative role in a completely new service sector. In this case, you may want to consult a functional resume template. This format places an added emphasis on your skills and qualifications rather than your work history, indicating your readiness for the role despite a lack of industry-specific knowledge. You may not want to completely gloss over your previous work experience as it has played a role in turning you into the professional you are today. Fortunately, administrative resume templates are available that are both functional and chronological, dedicating equal space to sharing your skill set as well as your relevant work history. These combination templates will appease those hiring managers who count experience among your many qualifications. A fair amount of thought should go into selecting your resume’s format. That said, you do not want to overthink it. Sometimes, a classic professional style works best. It eliminates images, background colors, and other design elements and instead focuses exclusively on content. If you believe the company you are applying with values who you are and what you’ve done over your creative skills, this is the format for you. If you are applying for a role in a high-tech industry that values analytical thinking as much as past experience, the modern administrative resume templates shown here will be of a great benefit to you. They allow you to show prospective employers (through advanced design elements) that you have acquired technical knowledge and expertise that will serve you well as an administrator. 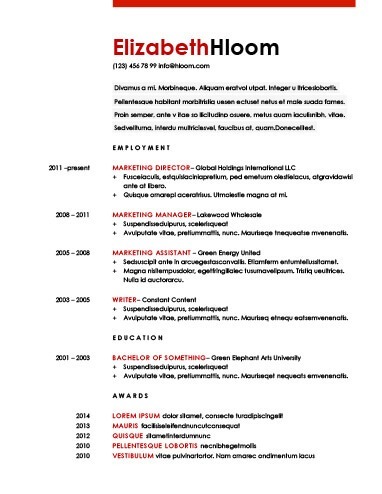 Many use the words "modern" and "contemporary" interchangeably, yet in terms of resume writing, contemporary administrative resume templates focus on a unique resume style. With information sectioned into columns, these read almost like newsletters, utilizing headers to draw a reader’s attention to the document’s most valuable information. This format may be ideal when applying for ultra-competitive positions where resume volumes only give recruiters a short time to review yours. Management, communication, and delegation skills are all utilized in administrative roles. Emphasize soft skills such as these here. Detailed metrics are vital when describing your past work achievements. In fact, USA Today lists them among their five most important elements to include when writing a resume. All you need to do is enter some basic information related to your skills, experience, and career ambitions, and our resume builder can help you in choosing the right resume format and content suggestions. All of this added support should have you feeling confident that your resume will surely open doors to new administrative opportunities.